The post part has a red stone surrounded by diamonds. The teardrop also has a pear-shaped red stone surrounded by diamonds. The diamonds surrounding the teardrop, especially in the bottom part is more substantial than the next pair. Lady Diana, before her marriage to Prince Charles, attends the premiere of For Your Eyes Only at the Odeon Leicester Square cinema. "...However, some of the sapphire jewellery that the Princess wears in public is in fact fake, such as four favorite pairs of earrings. 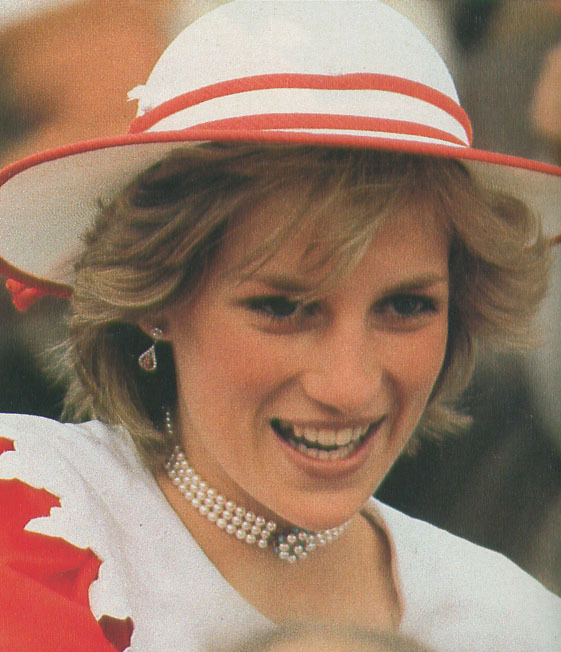 First she had tiny 'diamond' flower-shaped studs from which could be suspended 'sapphire', 'ruby' or 'diamond' pendants;..."
Princess Diana visits Jane Eliza Landing in a pearl choker given to her on her 18th birthday by the Spencer family. Pictures from Nellie, The Royal Jewels of the World Message Board. This is the blue teardrop earrings. The picture is in the book is a lot clearer and shoes the 'diamond-flower' shapes studs that Leslie Field writes about. This is the green teardrop earrings. 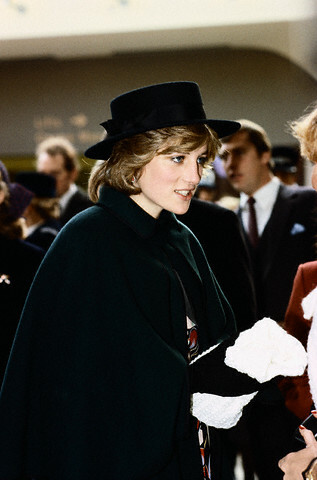 Princess Diana, pregnant with Prince William, wears a hat by John Boyd and a coat by Bellville Sassoon while visiting in Leeds. The photo below was taken on Nov. 1, 1982. The Princess of Wales attends a charity concert at the Barbican, wearing a green gown by Graham Wren. 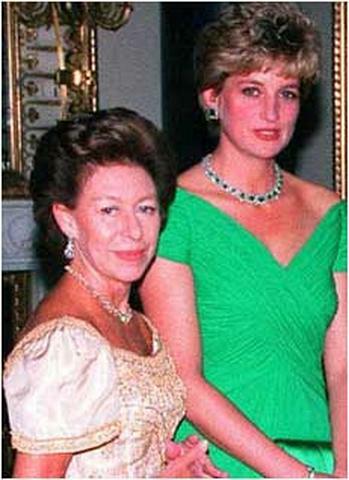 At this point, Diana had not received her diamond and emerald teardrop dangle earrings so she pairs the Queen Mary choker (engagement present from QEII) and diamond and emerald art-deco bracelet (present from Prince Charles) with her faux-emerald pave teardrop earrings. 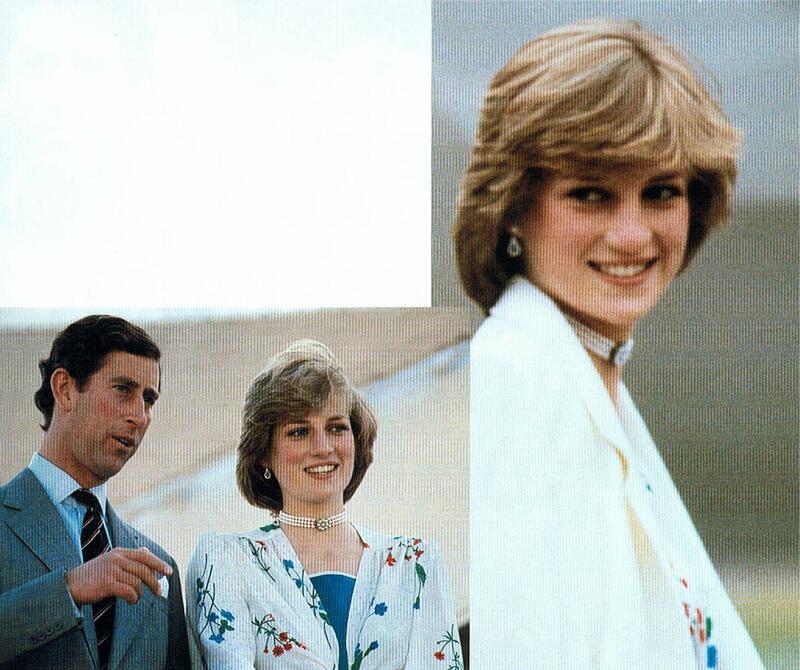 Picture scanned from 'The Story of Diana' by David Levenson and Trevor Hall, 1985. Unfortunately this book doesn't have page numbers but it's somewhere in the middle of the book. Note that the colored teardrop stones for the red, green and blue is not one pear stone but pave-set in the shape of a teardrop, surrounded by faux diamonds. Photo below is of the blue teardrop earrings just to show how the colored stones are set. Hard to tell what this earring is. 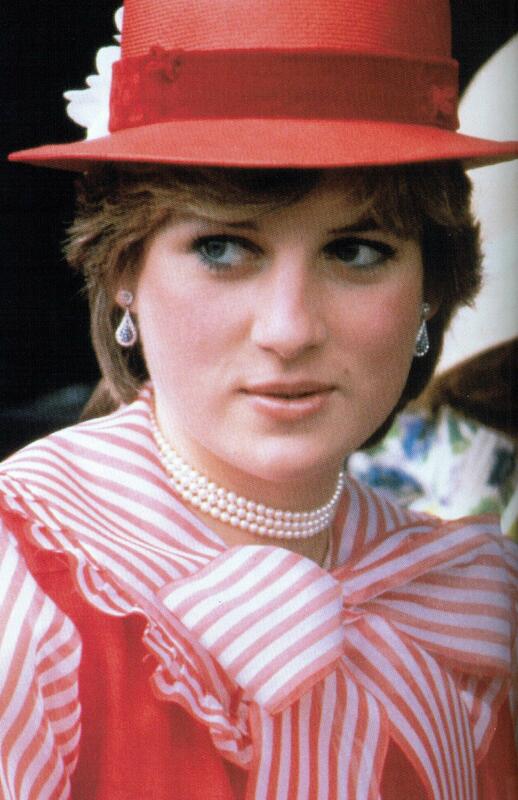 This is the only picture I have seen with Diana wearing this earring. 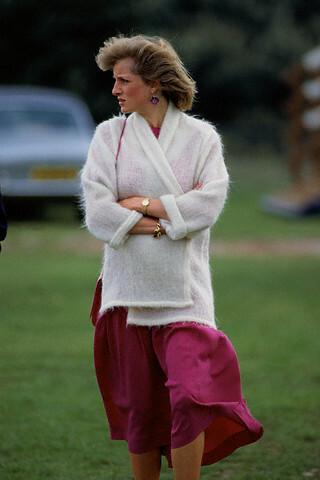 Princess Diana wears a white jacket and pink dress on a chilly day at Smith's Lawn. The pearl drop dangle is interchangeable with a diamond and ruby tassel. The rubies are marquis cut. The diamond and ruby part looks like wings. Princess Diana poses for a photograph with Maryam Ibrahim Babangida on a trip to Nigeria. 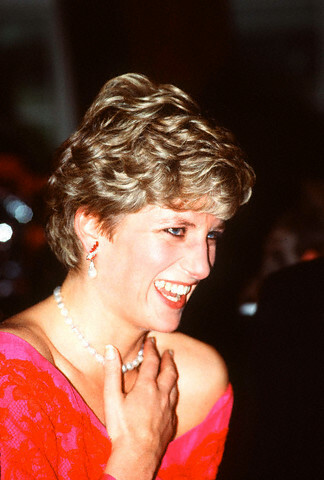 File photo: Princess Diana laughs during a dinner given in her honour by the State Governor and Mayor of Rio. 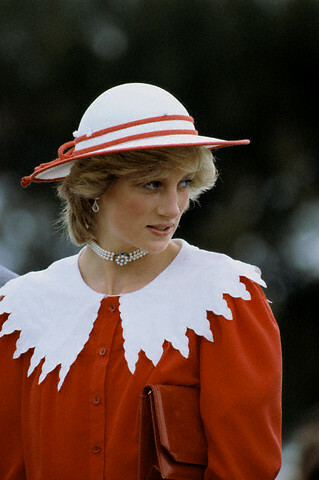 On the fifth anniversary of Princess Diana's death her loss is mourned by many people among them those who shared the laughter and her sense of fun. This is an interesting pair. One earring has an oval ruby with pearl and its pair has oval sapphire with pearl. There are ruby stones that hold the pearl drops. Princess Diana on an overseas tour in South Korea. 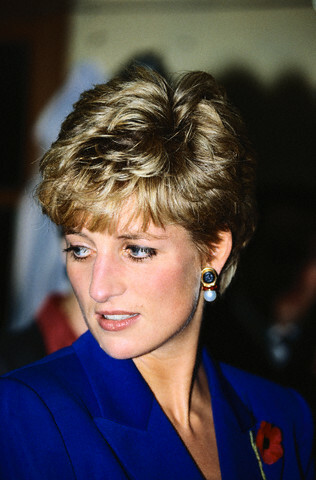 Surprisingly, in all my searches and looking through by Diana book collection, it seems Diana, Princess of Wales only had one GENUINE pair of emerald earrings. These diamond and emerald earrings were a 22nd birthday (1983) present from Prince Charles (A Royal Duty, Chapter 12, p.277, Paul Burrell, 2003). This is a wonderful close-up of the diamond and emerald earrings. 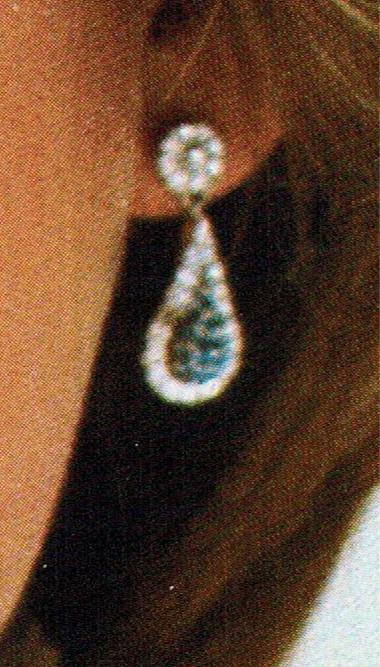 The green teardrop earrings Diana wore prior to 1983 is part of the faux jewelry (2nd earrings on this page) she wore. The faux-emerald earrings is shorter in length than this one and several people have assumed that it was lengthened to this new pair earrings. Note the faux-emerald teardrop is pave-set in the shape of a pear. The earrings from Prince Charles is one pear emerald stone and has always been this length from the first time Diana wore it. Picture came from "The Royal Jewels of the World Message Board". If this is your photo, please let me know so credit can be given. Below is a video showing movement of this beautiful earrings and the wonderful sparkle of the choker. 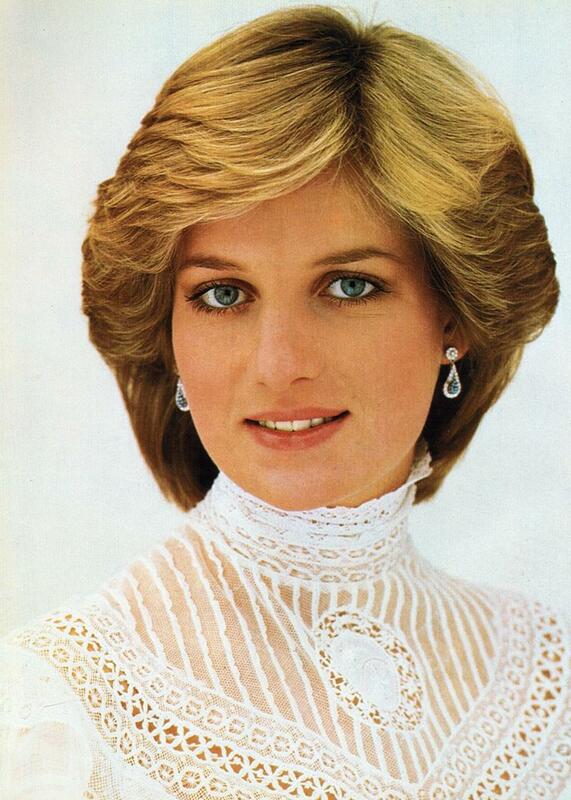 Unfortunately, this is the only picture I have of Princess Diana wearing this earrings and necklace. So, it's hard to get detail on the earrings. This is the only time she wore this set (earrings and necklace). Okay, I was mistaken. 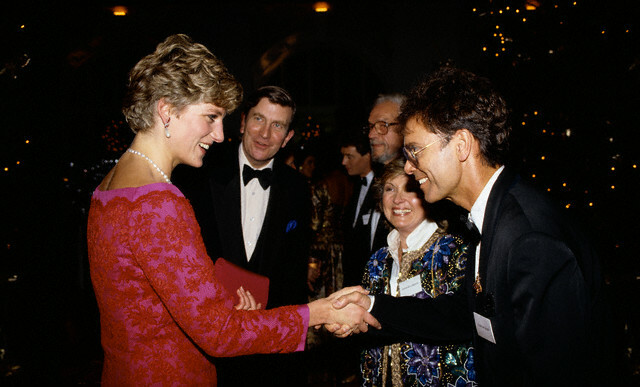 Diana did wear the green stone earrings at another event, a gala concert at Brangwen Hall Swansea in October 28, 1981. Picture scanned from 'Princess Diana Lady of Fashion' p.26, Introduction by Martina Shaw, Designed and Produced by Ted Smart and David Gibbon.